wedding gifts | Stampers With Altitude!!! Here’s another great idea for brides! Check out this cute project! This pillow box has a string hanging out of it. When you pull the string, the message comes out of the box. This one says, Will you be my matron of honor? Isn’t that cute!! I agree! All of my ideas can be customized for the Bride’s personal taste in colors. I just chose some popular color schemes. Inspiration comes from EVERYWHERE! Lately, it’s been coming from my niece. LOL. She has a growing business called The Pretty Pout. She sells lip balms, lip glosses, lip scrubs and more. You should check it out! Anyway, we have learned that the lip scrubs will fit in the hexagon box! YAY!! I have made a few samples of this box for her to show her what we can do. Over the next several days, I will be posting one of the combinations. I looked up “Trendy Colors for Weddings 2017” and found several really cool ones. 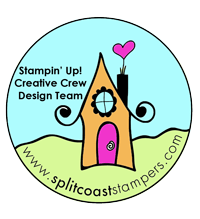 I have chosen a few and translated them into Stampin’ Up! colors. Here’s the first. Cherry Cobbler, Tangerine Tango and Very Vanilla.